Juicing doesn’t have to be hard. Add a nut milk if you want an orangesicle or add spring water to liquefy. Blend and enjoy first thing in the morning on an empty stomach or…. Put them in paper cups and enjoy your frozen treat later! The finer you chop the ingredients the easier it is to blend. 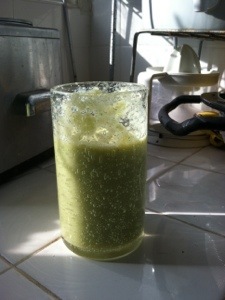 If you have a vitamix no need to chop. Alkaline forming, nutritious and great for the immune and circulation, not to mention a potent cruciferous vegetable rich in calcium and Vitamin C & K, indole-3-carbinol (I3C) and dindolylmethane (DIM).